The sight of a canopied seating and fresh juice organised by the Suryagarh team was a welcome relief after a morning spent exploring the Thar. Set up outside an abandoned human settlement, the location and timing of the ‘refreshment pitstop’ was perfect. Much as I love the desert, I was getting dehydrated pretty quickly. As I made my way to pick a glass of juice for myself, I heard some music being played in the distance. Music that was both familiar and unfamiliar, if not strange. It was familiar because I recognised the instrument, and unfamiliar because I had never heard it played outside of a Carnatic classical music katcheri (concert). Juice forgotten, I changed directions and headed towards the music and the musician, Sumar Khan, who was playing the morsing or the wind harp, a wind percussion instrument. That means we are even, said Sumar Khan, and both of us burst out laughing. Sumar Khan then went on to tell me how the morsing was an important part of the instrumental ensemble from the Thar region, and had been for centuries. However, the number of folk musicians who could play the morsing was dwindling fast. But I’m there to play the morsing for you, he said and played some more. … and also play many instruments, though his preferred choice of instruments are the morsing and the algoza or double flute, also known as the jodiya pava. Here he is playing a beautiful set of melodies (including a Raghupati Raghava Raja Ram) one morning at Suryagarh. During my stay at Suryagarh, I would head to the window where Sumar Khan would be playing his wonderful, soothing music in the mornings. I would listen and we would chat, he would tell me about the songs and the legends they were based on. His favourite was the tragic love story of Mumal and Mahendroo set at a time when the Kak River still had water and flowed from Jaisalmer, where Mumal lived, to Umer Kot (in Sindh, Pakistan), where Mahendroo was the ruler. 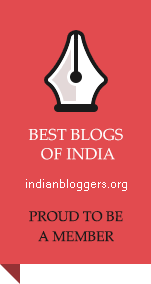 (do read the story here as written by Nisha Jha, a fellow blogger). Sumar Khan’s rendition of episodes from the tragic love story was soulful — whether it was on the algoza or his vocals. 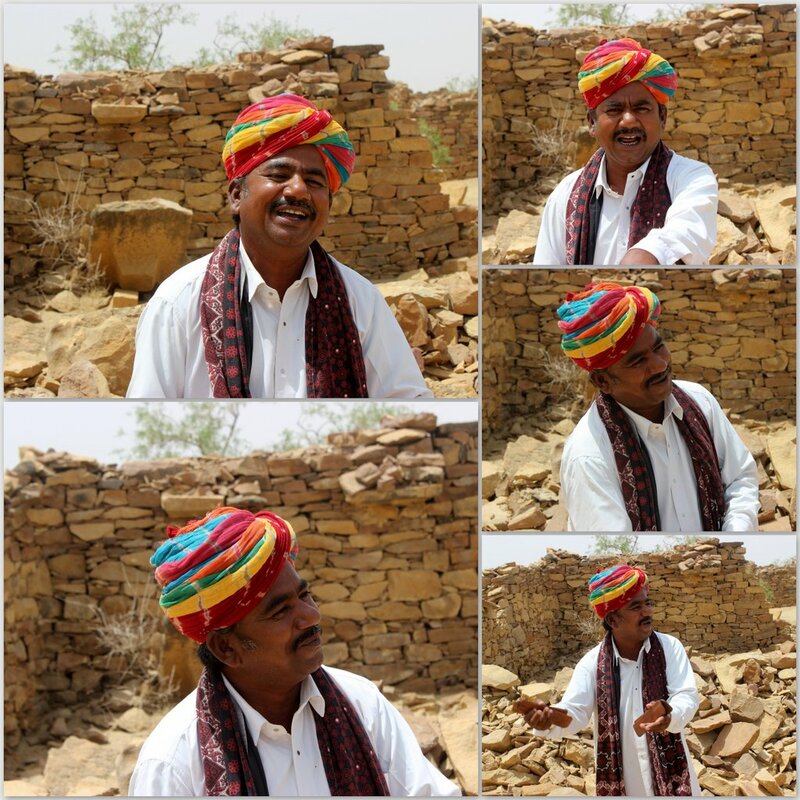 I could feel the story and the Thar come alive through his renditions. Kaki is another musician at Suryagarh and perhaps the most enigmatic of them all. For one, I don’t think her name is Kaki, which means ‘aunt’ in the local language. Nobody in Suryagarh knows her name and she is always called Kaki by everyone. For another, nobody has seen her face (even the women) for she is always veiled. Nobody knows her age either. Every day, at around 4 pm, she arrives and makes herself comfortable on a seat in the courtyard and proceeds to sing. Listening to Kaki sing was an awesome experience. For me, her powerful, full-bodied voice was a personification of the desert, the Thar itself. I have just one word for Kaki — RESPECT. Suryagarh also has a large group of singers from the Manganiar community, some of whom I had heard during my previous visit. But unfortunately, like the previous visit, I was unable to interact with them, and my experience of their incredible music was through what they performed. Led by Mehboob Khan, the Manganiars welcomed my group to Suryagarh on the day we arrived. Later that evening, I caught the last song of their performance for hotel guests — the timeless Dama dam mast qalandar. The evening breeze and a full moon night added to the whole experience. I heard them again the next evening at a special outdoor performance and dinner organised for our group. Mehboob Khan and his group sang a variety of known and unknown songs (for me, that is). Two of the songs they performed stood out. The first was a known song — Yaara seeli seeli (made popular in India by the film Lekin), which I managed to record. You can click on the video below to listen to it. Apologies in advance for the awful sound quality. The second song — an unfamiliar one — was Jaago Krishna Kanhaiya Jaago and it comes from Sindh. I didn’t, or couldn’t record it, so entranced was I by the story and its rendition. The song is based on the story of a holy man who was blind and known for his healing powers. There were people in his community who didn’t like the holy man and doubted his ability to heal others. One day, they got a dead infant and asked the holy man if he could cure the child. When the holy man said yes, the infant was placed on his lap. The holy man realised immediately that the infant was dead, but also remembered his words of healing the infant. He then sang Jaago Krishna Kanhaiya Jaago as a prayer to Lord Krishna. The dead infant was no longer just a dead infant, but Krishna himself who was being invoked to rise, to awaken. I have never heard something so beautiful and so heartfelt and when Mehboob Khan and his group finished singing the song, I realised that my cheeks were wet. any organisation that patronises artists and their art is a great one and has my respect. Enough said. Note to Self: Considering that most of the videos are incomplete or of poor quality, it might be a good idea to just listen to the music than to record them ! Unfortunately I have used my broadband and hence cannot enjoy ur post and photos. With slow speed it is like drinking at a pond thru a straw. Saved the link for access when it gets restored. Did manage to briefly access the earlier post – it was interesting to glimpse at two versions of chariots. It was sad and happy- sad to see the disrepair and the wanton damage by invaders and happy to have ‘seen’ it thru ur posts. The sculptures were amazing even in their present state. Dont know about various schools that exist – did seem like sculptures found in Jain temples though it was all Hindu pantheon. I hope you managed to listen to the music I have shared in this post. Regarding the temples of Kiradu, I still can’t get over their location or their beauty. Each time I go through my photographs, there is some detail that I missed previously cropped up. The beauty of old Jain temples is that regardless of where they were, they followed the vernacular architecture. So a temple in Karnataka would be different from a temple in Tamil Nadu would be different from. Temple in Gujarat. On a visit to two Jain Temples in Kanchipuram, if I hadn’t known of their location, I would have thought they were Hindu temples. I will be writing about those temples soon. Fir se jana padega.. Aapne to purani yaaden taaja kar di.. The way you narrate is so vividly descriptive , I felt being there with these musicians and interacting! !